After an extended absence that may have had something to do with a lousy follow-up to his stellar run as the main villain in season two of The CW’s Arrow, Manu Bennett’s Slade Wilson finally returned to the series for the finale of its fifth season. Unfortunately, that episode ended with virtually every character other than Stephen Amell’s Oliver Queen seemingly getting killed off in a massive explosion, and though anyone who has ever seen a TV show should know that not everybody will be dead when Arrow comes back for a sixth season later this year, it seemed fairly safe to assume that a guest star like Bennett wouldn’t survive. Apparently, though, that’s not the case. Speaking at Heroes & Villains FanFest in Nashville this weekend (via TVLine), Amell teased that Bennett is “back to being a part of the show” and that he might pop up “multiple times this year.” Amell didn’t offer much more information than that, so it’s possible that Wilson really is dead and Bennett will appear in some kind of convoluted flashback sequences, but it sounds like we’re getting more Deathstroke either way. 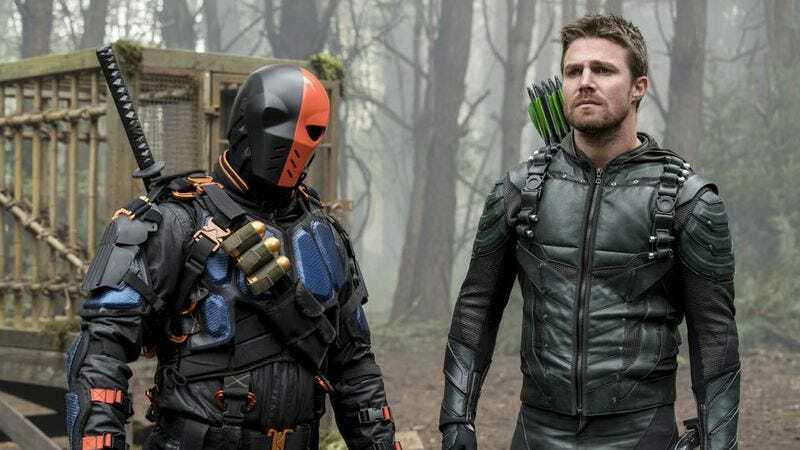 Slade Wilson aside, Amell also teased that someone who hasn’t been on the show since its first season will also be coming back, but he didn’t offer any real hints. Considering that a lot of the characters who only appeared in season one are dead, though, it might be tough to find one who even could come back, and that’s without assuming that the show will play some “they never actually died” trick, which is entirely possible and very likely.